Zone: 0 is a Sonic the Hedgehog game information site aiming to provide reference and strategy guides of more depth and clarity than ever before. With screenshots, maps and incredibly thorough descriptions for every level, Zone: 0 is an unofficial Sonic site like absolutely no other..
A cheerful little water level set around crumbling ruins in a small lake, hidden within a thick forest. The water divides the stage right along the middle, and one main route (filled with intertwining roads) lies above it, while the other is submerged below, where things can get much more tricky. As long as you stay on the high road, you should have few problems with this brief stage. 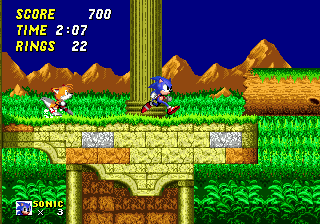 Sonic & Knuckles guide complete: Death Egg Zone added, The Doomsday Zone and game endings added to the Stages and Stories page, and Downloads page added.